The material is processed into a film for integration into electronic displays, particularly for e-readers. The Motorola F3 was the first mobile phone to employ E Ink technology into its display, taking advantage of the material's ultra-low power consumption. In addition, the Samsung Alias 2 uses this technology as the display on the buttons change. The October 2008 limited edition North American issue of Esquire was the first magazine cover to integrate E Ink, and featured flashing text. The cover was manufactured in Shanghai, China, was shipped refrigerated to the United States for binding and was powered by a nominal 90-day integrated battery supply. According to the manufacturer, "The principal components of electronic ink are millions of tiny microcapsules, about the diameter of a human hair. In one incarnation, each microcapsule contains positively charged white particles and negatively charged black particles suspended in a clear fluid. When a positive electric field is applied, the white particles move to the top of the microcapsule to become visible to the reader. This makes the surface appear white at that location. At the same time, an opposite electric field pulls the black particles to the bottom of the microcapsules where they are hidden. By reversing this process, the black particles appear at the top of the capsule, which now makes the surface appear dark at that location." On June 1, 2009, E Ink Corporation announced an agreement to be purchased by one of its primary business partners, Prime View International, for US$215 million. 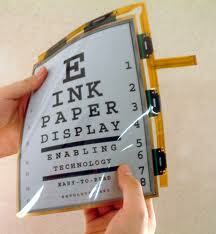 It is predicted that the purchase by Prime View will speed the development of color E Ink. 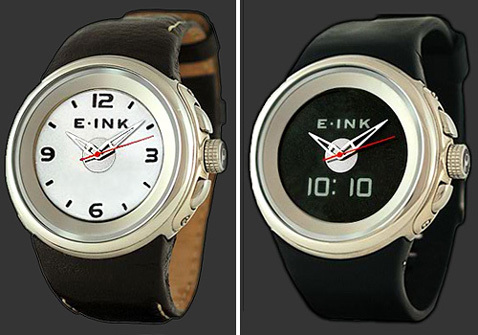 On July 31, 2010, E Ink announced a second generation of E-ink displays, a higher contrast screen built with E Ink Pearl Imaging Film. The updated Amazon Kindle DX was the first device announced to use the screen, and the Kindle 3 also incorporates the Pearl display. 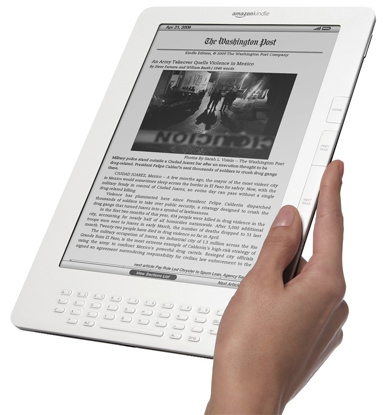 Sony has also included this technology into its latest release of the Sony Reader Touch edition. On November 9, 2010, E Ink announced a third generation of E-ink displays, a color display that is easy to read in high light. The E Ink Triton will display 16 shades of gray, and 4096 colors. E Ink Triton is being used in commercially available products such as the Hanvon color eReader.